The Domaine de Manoir de Montreuil is owned by Patrice Giard and his wife Michelle, and have now been joined by their daughter Estelle. The Giard’s domaine, located in the heart of the Cider route, is undoubtedly one of the most beautiful in the Pays d’Auge appellation, especially on a blue sky, fluffy cloud-type of afternoon. 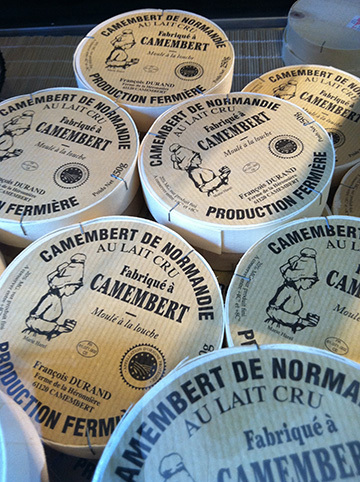 It lays on a series of hillsides and valleys a few miles from Cambremer, capital of the cider route. It is an ideal spot to take photographs of a classic Normandy landscape with black and dark brown normand cows grazing under free standing trees loaded with apples. The family can trace their history on the property in the hamlet of Montreuil back twelve generations to the 1700’s. 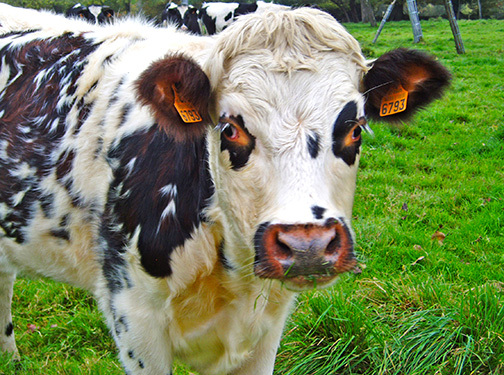 Along with the apple side of their income, they also have about 200 cows, sixty of which are used for milk. 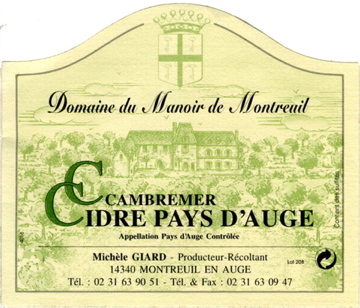 The Giards have 30 hectares (74 acres) of apple trees, planted entirely in haute-tige (tall trees that reach fifty feet in height). Of their 3,000 trees, half of them were planted in 1990 and the other half was planted by Patrice’s father, Roger. Having haute-tige trees serves a double purpose for Giard in that his cows are free to graze within the orchard. They eat the lush grass and naturally enrich the soil with their excrement and aerate the earth with their weight. It’s a natural cycle that allows them to work without any soil fertilizers. In August the cows are removed from the orchards so that they don’t eat any of the apples that fall and so that their caca isn’t on the ground when the apples are harvested. The soil on the property varies: the flat ground is mostly comprised of clay and flint while the slopes are primarily chalk, with very little topsoil. The apples are a mixture of the four types, and Giard is naturally a big defender of the old varieties, which are less productive but have plenty of the tannic compounds called polyphenols and lots of sugar. Some of the newer varieties have less polyphenols, and their ciders are therefore have less color and less length. Apples are collected from the ground between September and December. As with preceding generations, Giard waits for the fruit to fall, then collects it after it has been on the ground, sometimes for as long as three weeks. He is in no hurry to pick it up, as they are protected from rot by a thick layer of grass beneath the trees. This allows their sugars to concentrate a bit more, and their densities to rise. 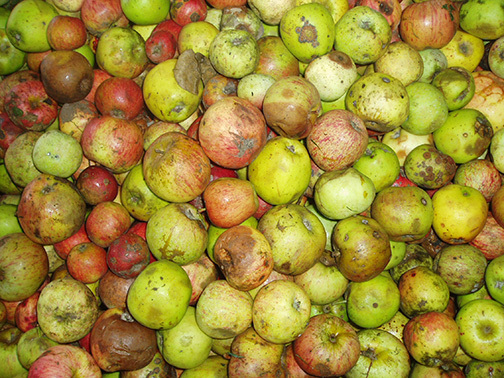 The Giards use the following apples in their cider: The bitter varieties Domaine, Mettais, Frequin Rouge and Saint Martin, sweet and bittersweet varieties Binet Rouge, Joly Rouge and Bisquet, and acidic varieties Rambault and Petit Jaune. 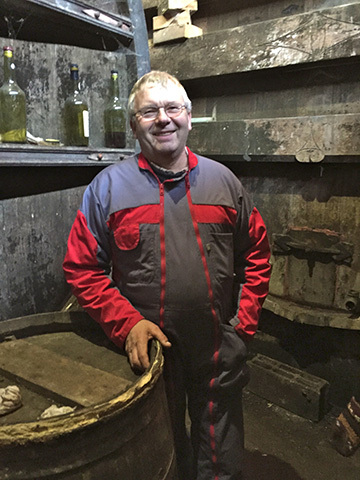 The juice destined for the Pays d’Auge cider is pressed in a balloon press and then goes into stainless steel tanks. Fermentation begins using only the indigenous yeasts. The tanks are heated slightly and fermentation begins using only the natural yeasts. The solid elements are pushed to the top by the carbonic gas, and the tanks are drained, leaving behind the solid matter. Fermentation continues until the producer feels his cider is ready to bottle, that is not too sweet, bitter or acidic. It is then bottled. The bottles are stored standing up while the sugar and yeasts left in the juice react together. After about six months, there is sufficient bubble for the cider to be ready to commercialize. Because the cider has not been disgorged or filtered, there will continue to be a reaction between the yeasts and sugar as the months pass, and natural ciders like this will become dryer as time goes on. It is a living product that continues to evolve until it is popped open and consumed!